A belly button that has changed from an “innie” to an “outie” may be a sign of an umbilical or belly button hernia. The umbilical ring of the belly button, or umbilicus is a natural area of weakness in the abdominal wall. Overtime with vigorous activity and/or pregnancy, the umbilical ring will stretch and the area will enlarge to form a hernia. A hernia is a full thickness defect through a tissue plane. An umbilical hernia is a hole through the abdominal wall, through which fat and/or intestinal contents can enter into. Hernias do not go away and may enlarge through multiple pregnancies and over time. The danger of a primary hernia is that a segment of intestine gets trapped in the umbilical defect, which is called incarceration. This could lead to an injury of the intestinal segment called strangulation or blockage of the intestinal track. This only happens in moderate sized umbilical hernias and most small hernias have only pre-peritoneal fat contained in them. Pre-peritoneal fat lines the abdominal wall and is not associated with the abdominal contents. Small umbilical hernias are a sign of abdominal wall laxity and are common in the patient who has lost weight or has had multiple pregnancies. The repair could entail repairing the umbilical hernia primarily, though with the previous stretch on the surrounding abdominal wall will thin and weaken the tissue. This general weakness called a Diastasis Recti could make the repair ineffective and limit its durability. A significant Diastasis Recti could necessitate the use of mesh to span the area of weakness in order to patch the umbilical defect. To avoid the use of mesh and ensure a durable repair in the female patient with post-pregnancy abdominal wall laxity, a diastasis repair could be combined with an umbilical hernia repair. This will primarily repair the umbilical defect and reduce the hernia contents in combination with the repair of the entire area of central muscle laxity. Considerations for hernia repair include discomfort at the hernia site, 6 months from delivery, an enlarging belly button, and finished having children. Umbilical Incision just under the belly button with a hernia repair with limited diastasis repair. 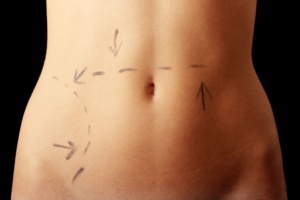 Lower abdominal incision in combination with skin removal and liposuction in the form of a mini tummy tuck or full tummy tuck (abdominoplasty). Recovery is under 10 days with resumption of cardio at 2 to 3 weeks and full lifting and core work at 6 weeks. Andrew P. Trussler MD is a plastic surgeon in Austin Texas who has advanced training in cosmetic surgery and significant experience in abdominal aesthetics and reconstruction. He can help develop a plan to repair your umbilical hernia and strengthen your core with a diastasis recti repair with or without skin removal and liposuction. Dr. Trussler’s Austin plastic surgery office can help guide you in recovering your abdominal shape and strength to help you look and feel your best.